There’s nothing lovelier to drop off to someone with your presents than something homemade or home baked during the festive season. I usually keep my parents stocked up with mince pies and shortbread for serving up when people come over, but I always like to have a boy of something to take with me when visiting over the festive season. I’ve just spent a lovely couple of days with my fiancé and his family, so I made sure I had a box of mince pies, a gingerbread and a ham to take with me. 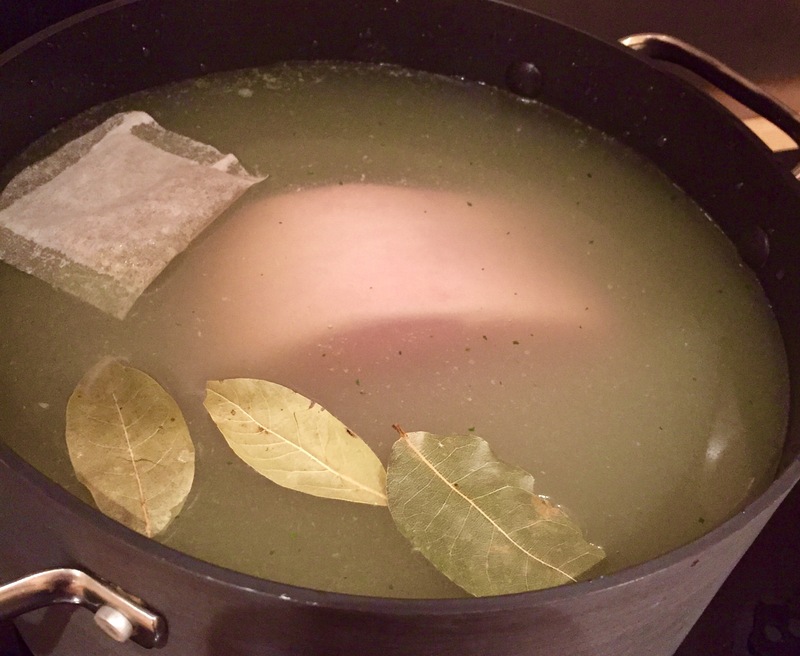 Primarily, though, my ham recipe is generally wheeled out on Boxing Day to bulk out the leftover turkey for a quick supper and lazy lunches in the days to come. 1. 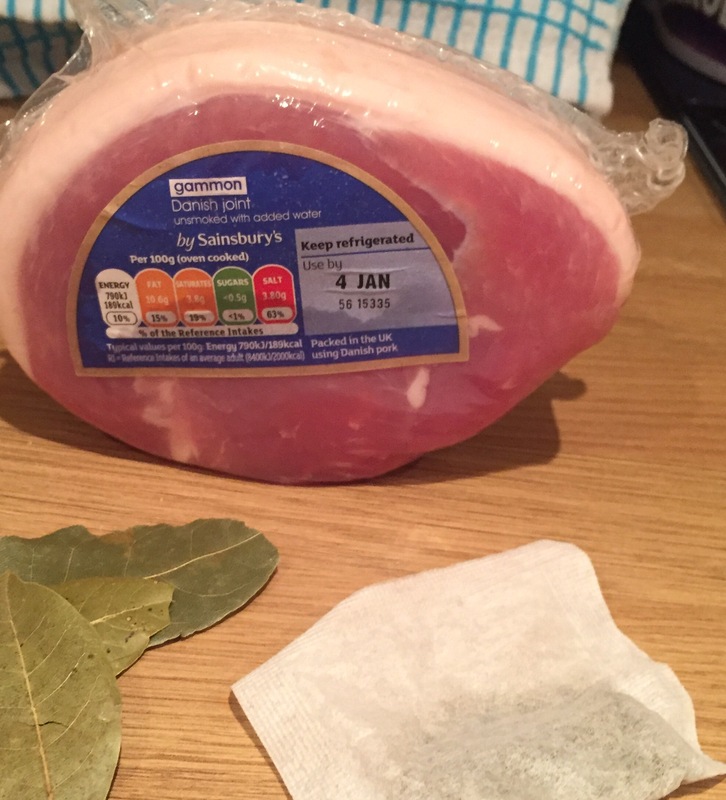 Check the suggested cooking time on your gammon’s label. It should give you a time for boiling and baking. Go with the boil time suggested. For this size it was 42 mins – 30 mins per 100g – as I knocked off the extra half hour for the pot – that will be replaced by the baking later on. 2. 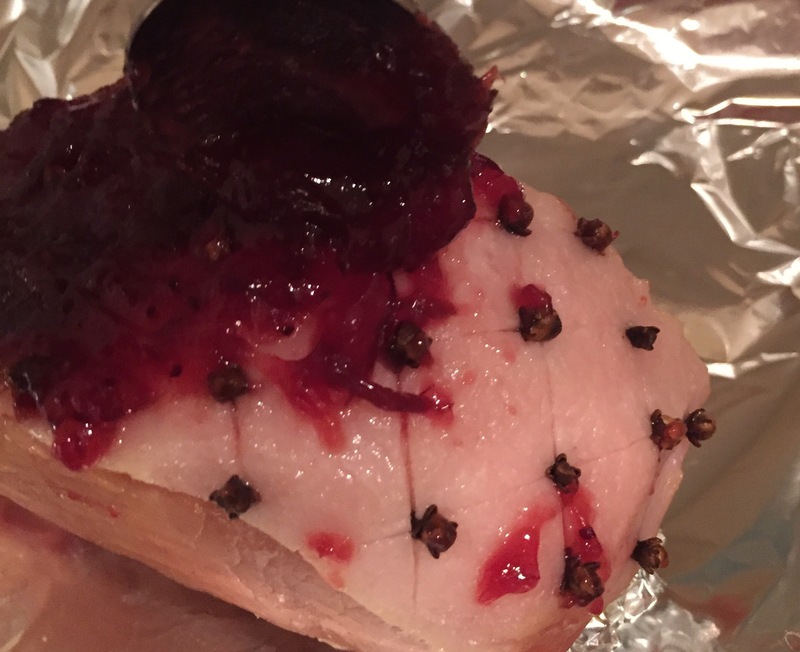 Unwrap the gammon and check whether there is a papery film wrapped around the joint. This is to help it to keep it’s shape. In my experience, it will remain round enough if you remove it, so carefully lift it up, and snip it off. 3. Set the gammon in a large soup or stock pot. Pour in the apple juice, add the dissolved stock cube and top up with water until the gammon is just covered. Add the bay and bouquet garni. Put the lid on and set to a medium high heat. 4. 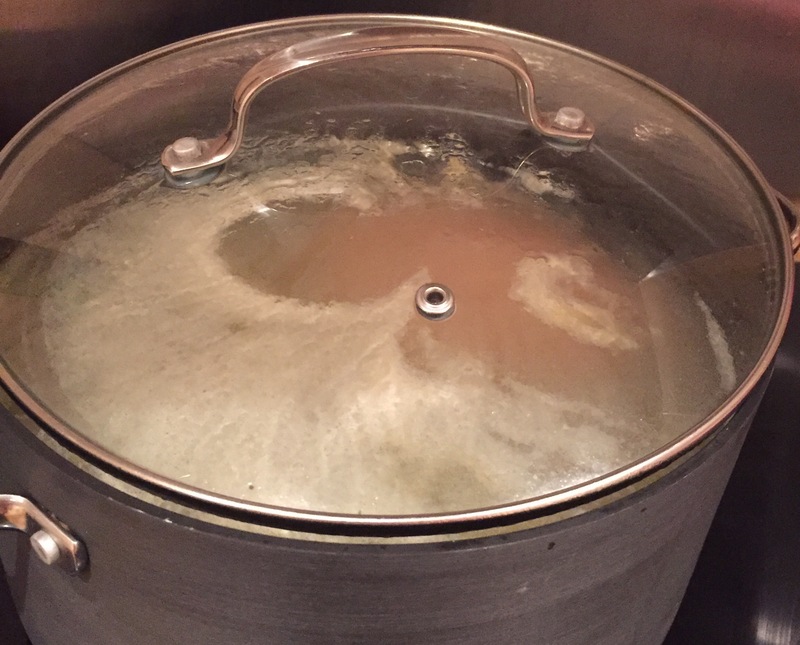 When the pot hits a steady but not over-zealous boil, start the timer, then leave well alone until the boiling time is up. 5. 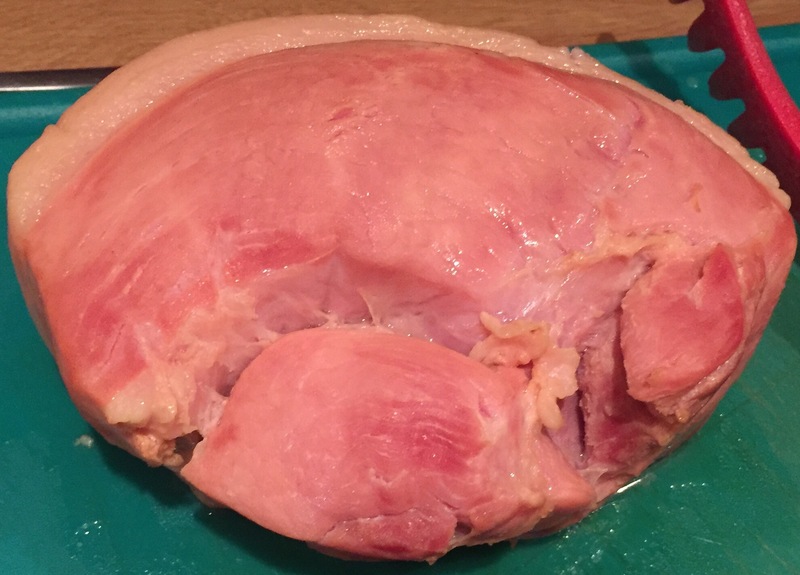 Carefully remove the ham from the water (I’m not quite sure at what point a gammon becomes a ham but let’s go with when it’s cooked!). Set aside on a chopping board, and preheat the oven to 170c fan. 6. Next, using a paring knife, carefully trim off the rind, making sure to leave a layer of fat to glaze. 7. Using the same knife, score the fat diagonally in both directions so that the scores criss cross. 8. Stud each intersection with a clove. This can be a bit fiddly but it really helps to give the ham a bit more flavour. 9. 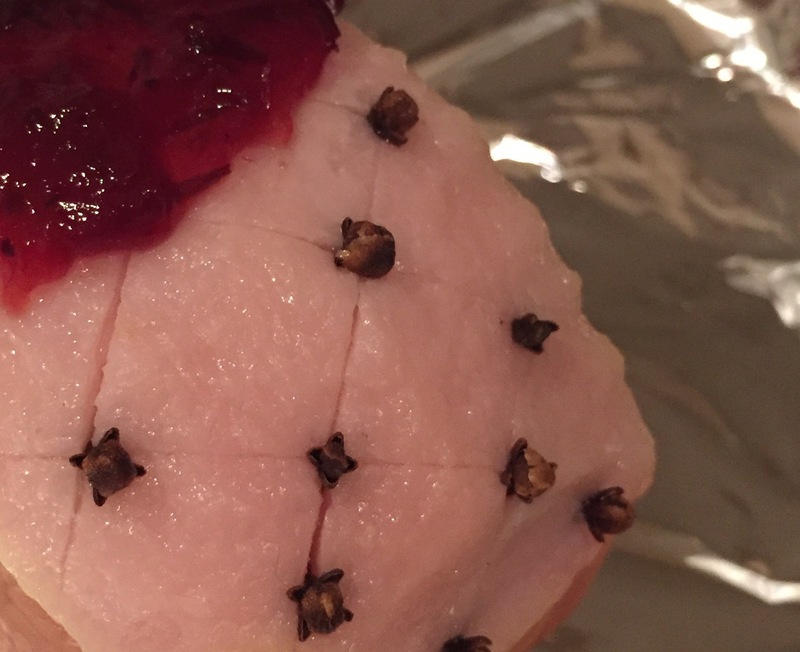 Get the ham settled on a roasting tray. This one went a little wonky so I just scrunched up a ball of tin foil to shove under the higher end to help it balance. Spoon on the cranberry sauce. 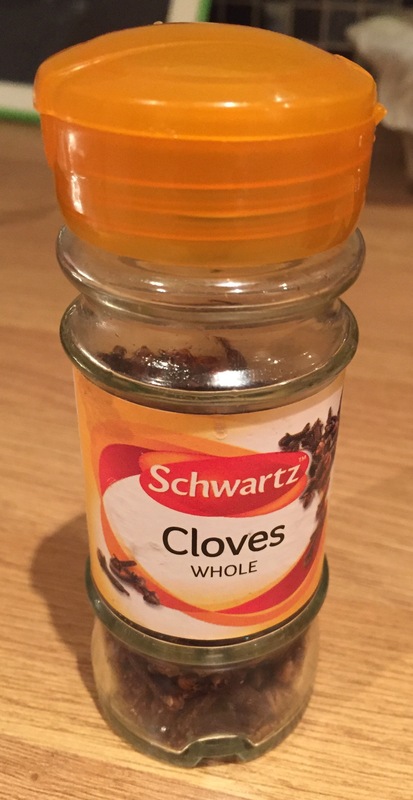 I just used the cheap stuff you can find in the supermarket but use whichever kind you like. Mr Brooker has a great recipe for homemade cranberry sauce if you’re feeling so inclined. 10. 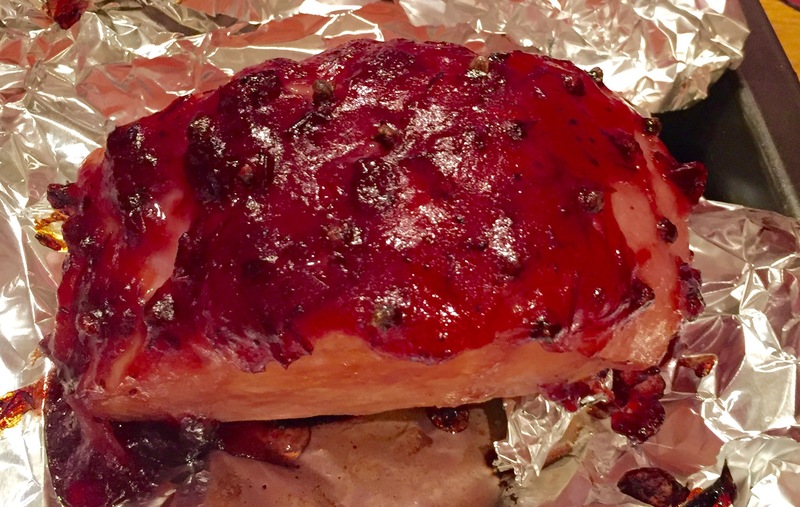 Put the ham in the oven for 30 minutes until the glaze sets. If any of it melts and drops off, just spoon it back on. 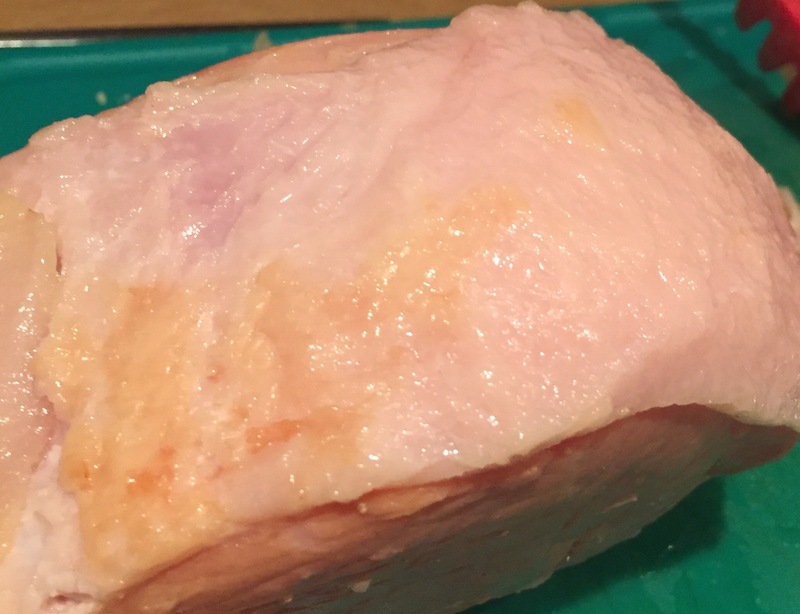 Your finished ham should keep in the fridge for a couple of weeks. You can thinly slice it for sandwiches or salads, or cut thickly and cube for a great tasting addition to a pie or pasta sauce.